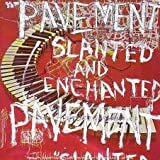 As if Pavement's indie rock masterpiece wasn't amazing enough when it was originally released in 1992, it was re-released with enough rarities and outtakes to make Slanted & Enchanted: Luxe & Reduxe a must-own as well. An album such as this must be listen to for one to truly appreciate it. The unconventional pop structures and off kilter melodies of songs like "Summer Babe" and "Fame Throwa" while make indie fags and alternative rock pee drinkers both run around the house with their pants off in excitement.